Glory Be to St. Expedite!!! 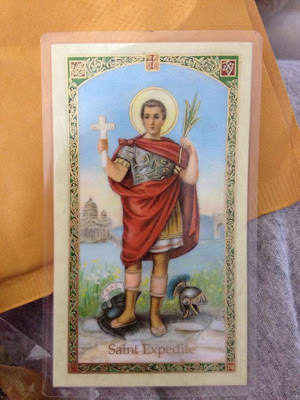 This post is a HUGE Shout Out to St. Expedite publicly thanking him for working a seemingly impossible miracle for me. I was chosen for a very high profile job that is not only a Full Time position but a Permanent one! I have been working contract jobs for the last 5 years or so and as everyone knows... this economy is brutal, thus the job market mirrors that. 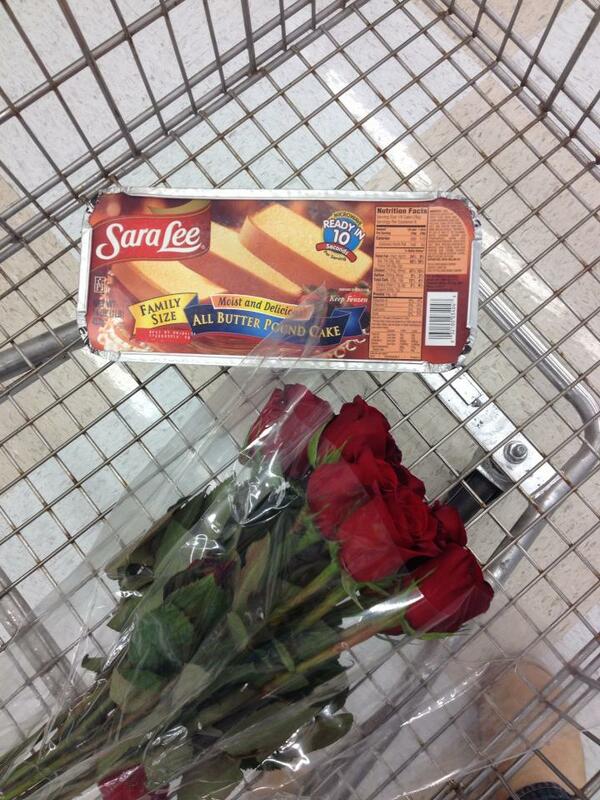 One runs back out to the store to buy more pound cake and flowers of course! Red Roses this time for granting my request... a Dozen! 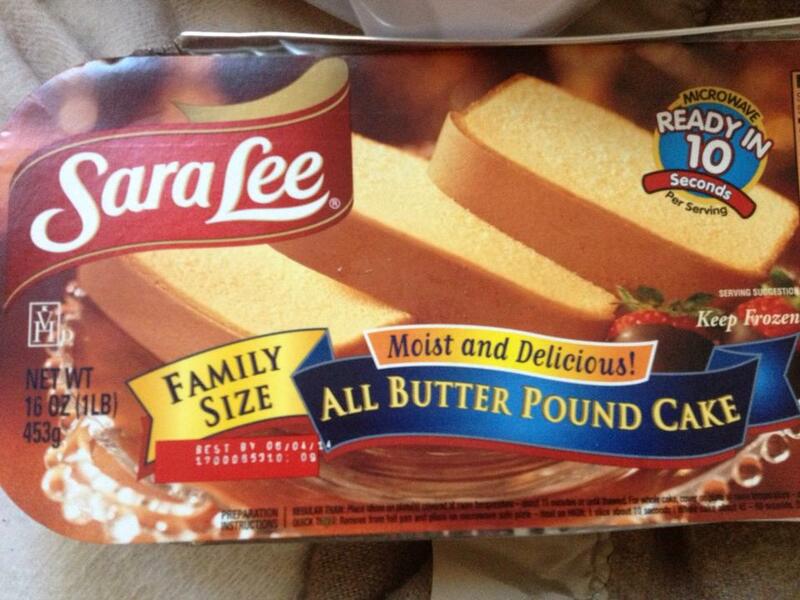 Forget the 6 pre sliced cakes.... this called for a Family Sized loaf! and Voila'... the finished product! An altar fit for a King. But in this case, a Saint. 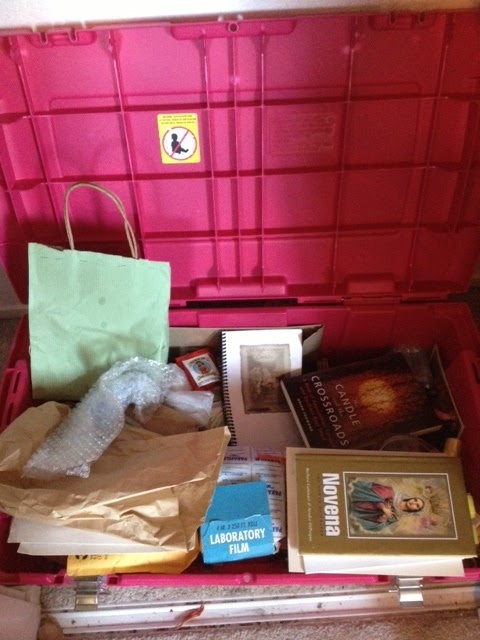 Knowing that St. Expedite's Feast Day was fastly approaching I started to get into panic mode because I had packed away my beloved Saint and all his paraphernalia. Gasp! 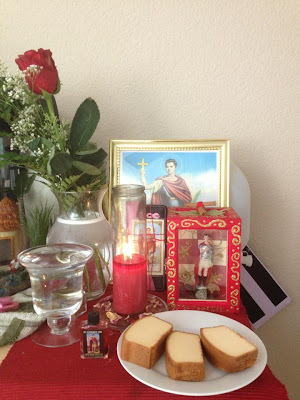 Feeling out of sorts and needing some guidance on the situation as I wanted and felt so strongly to observe and serve St. Expedite on his day, I called on Papa Newt to give me some suggestions on how to honor him when I didn't have a proper altar set up. When in a pinch, I was told that even just an image or a prayer card will do. 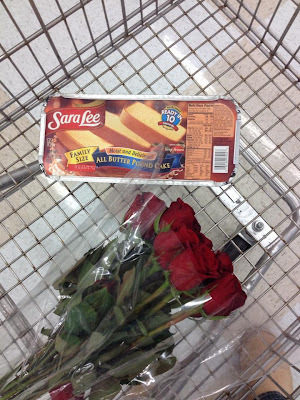 A glass of water, some flowers, a small candle, some Sara Lee pound cake. I always have a nice laminated St. Expedite Prayer Card in my wallet at all times so I went to fish that out and place it on a table that would become an altar to him that day. Interestingly enough as I was talking to Papa Newt describing the card to him, I felt that I needed to send him that very card and buy 3 new ones. So that is what I did. Interestingly enough, after posting pics of these laminated beauties, 2 people came forth inquiring about where I got them and if I could send them one? 2 more folks will have this very card in a few days for their own. When St. Expedite "talks"... You listen! Well, the heavens opened up and answered my prayer because I got a call from my old roommate asking me if I could come watch her dog and house sit for the next 5 days as she will be out of state visiting family. So... 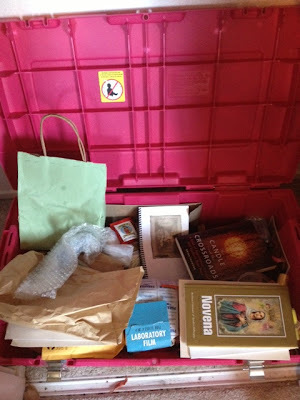 I "unearthed" him, his shrine box I made him, his photos, anointing oil, and various offerings. And of course, I had to head up to my favorite conjure shop Lucky Mojo to get a St. Expedite vigil candle! I couldn't wait to get back to the house and set everything up. Let me tell you.. I can't even describe the AHHHH feeling I got when setting up his altar. It was as comforting as wrapping up in a warm fuzzy blanket on a cold day. Then the "excavating" began... Yet he was surprisingly easy to find. I knew just where he was packed away at. I chose yellow as it is one of his favorite colors; I reserve red roses for "payment" after he has granted my petition. My own personal preference. 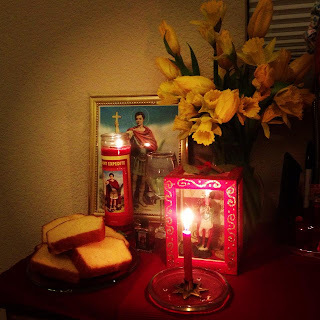 All put together along with a glass of water, a 4 inch offertory candle to be lit and consumed on his Feast Day (April 19th. ), and Sara Lee Pound Cake to follow on the empty plate you see here. 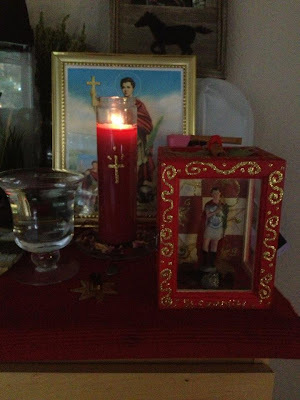 In case you are not able to honor St. Expedite or dedicate a small altar to him on your own but would like to petition him, Papa Newt can be contacted to place your petition on his altar he has made available to anyone in need by either clicking on his name posted above or you can contact him at: info@papanewt.com to email him your petition directly. Get your petitions in folks! It's Free! But be sure to pay St. Expedite should he come through for you! If you don't, he has been known to take what he has given you and then some. Yikes! Glory Be to St. Expedite! 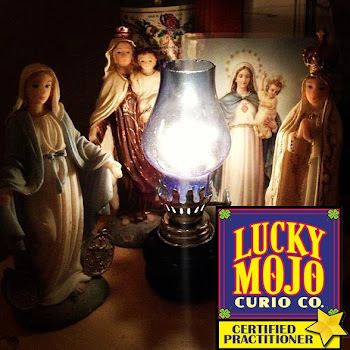 Share this on your Facebook and let me know that you did, to enter a chance to win either my Product of the Month: "The Magical Power of the Saints" book & Lucky Mojo All Saints Incense Powder OR a Custom St. Expedite spiritual working by Papa Newt! ﻿﻿ Yay! Contest time once again boys and girls!... This month I am going to be merging 2 contests into 1 due to the fact I am currently in the relocation process (read: packing & moving). So I won't be able around my blog much this month. 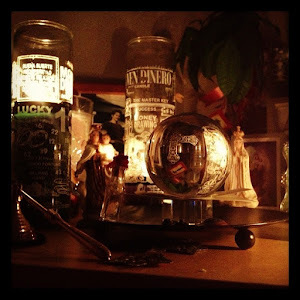 First up is a custom St. Expedite spiritual working performed by conjure worker Papa Newt! 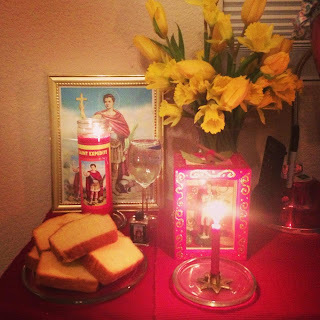 In honor of St. Expedite's Feast Day on April 19th and for coming through for me once again, I wanted to offer this to someone who may be in need of a ritual performed on their behalf. 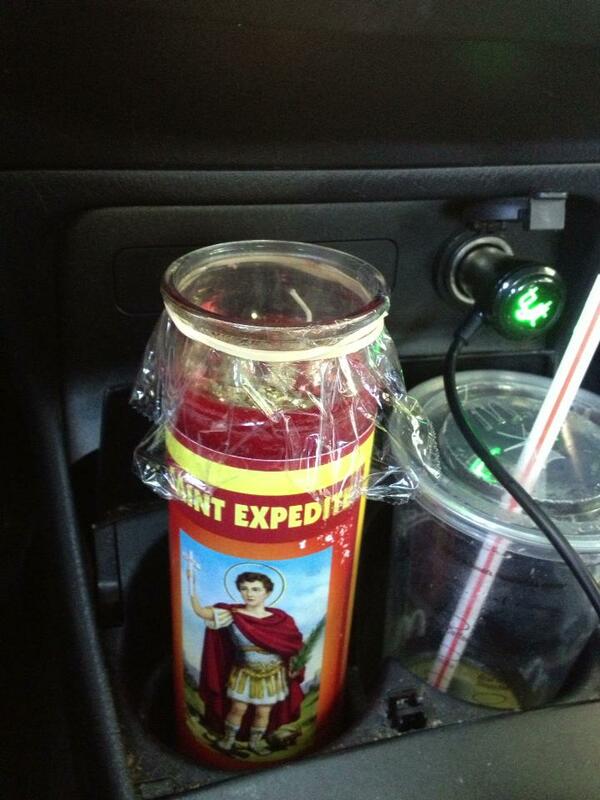 I have personally had a St. Expedite working done by Papa Newt just recently when my car took a dive. It was in the shop costing some serious bank roll and I didn't know how I was going to pay for it. So he stepped in and created a customized ritual working petitioning St. Expedite on my behalf. Well IT WORKED. I can't Thank St. Expedite and Papa Newt enough! 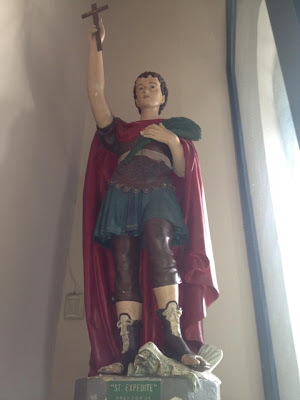 Of course, when St. Expedite comes through for you whether it be that you petitioned him on your own or someone does it for you on your behalf, you must pay this Saint for answering your request. 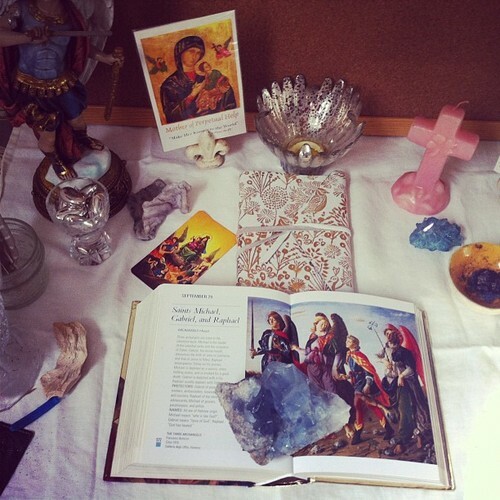 I have worked with St. Expedite in the past with mixed results, but was in no shape to really calm down and focus in order to work with him on my own. Seeing as Papa Newt has had a long standing working relationship with St. Expedite, I knew that I had picked the right spiritual worker to work on my behalf. 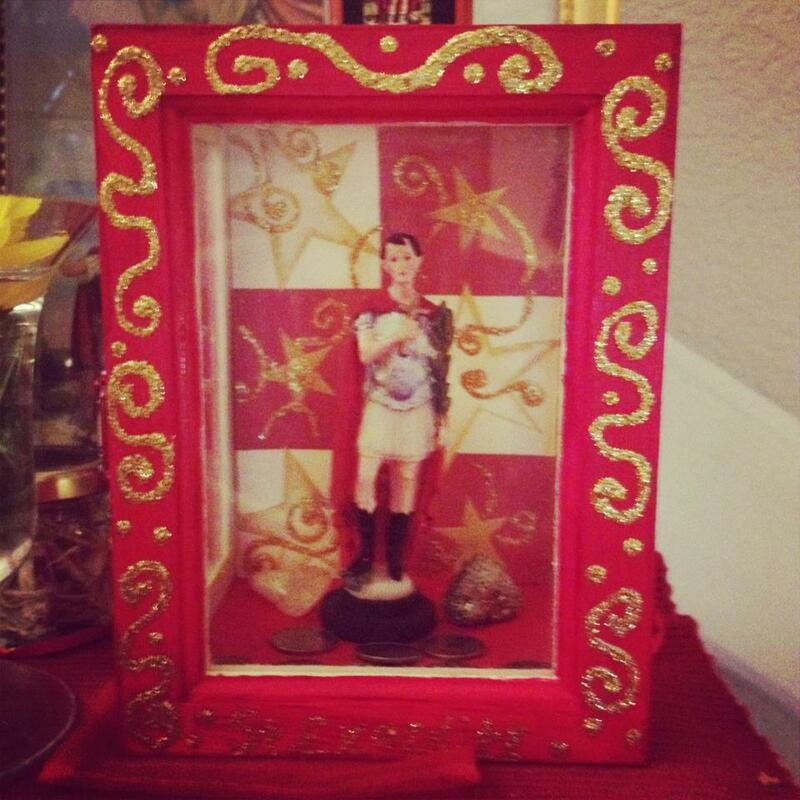 1) How did you first come across St. Expedite and why did you choose him to work with? The first time I found St. Expedite was while preparing for Confirmation in my teen years of Catechism. To prepare for this ritual we had to research, and select a Saint's name. 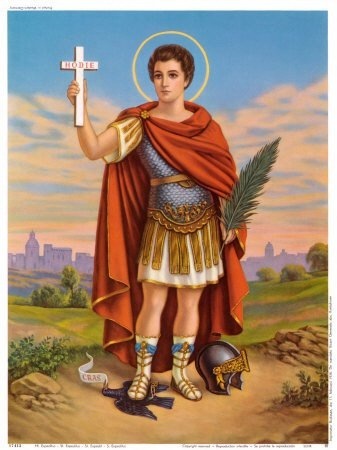 In the various books I've read – I believe that it was in a book not provided by the church -- is where information about St. Expedite was first found. 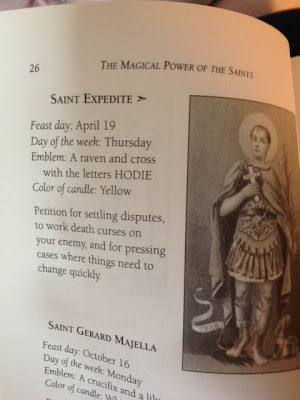 However, St. Expedite did not come back into my life again until my mid-20s during a very difficult time. It was then when his swiftness in helping with situations was made known to me. Because of his great help I decided to dedicate a little space to honor him, and the relationship has grown from there. 2) Describe your experiences working with and relationship with this particular Saint. In the early days of developing a working relationship with him was bumpy at first. It was like learning to ride a bike for the first time! 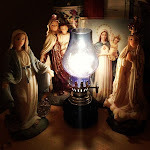 When one starts to work with spirits, such as the Saints, you begin to understand their dynamic presence. Really begin to realize the Saints are much more than their images. There is a personality. Likes and dislikes. There was a whole new level that was never taught in Catechism! St. Expedite has graciously helped in times of financial difficulties, make it possible to have a car in order to keep a job, and so many more blessings. He is truly a wonderful ally. 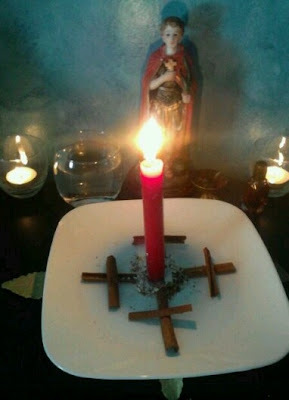 3) What are the common misconceptions when working with St. Expedite? One misconception is that St. Expedite will do any job he is petitioned with. This is not so. St. Expedite can and will not accept a petition, especially if what is requested is not something that was strongly needed. 4) Does he come through for you all the time? If not, what are the possible reasons why he didn't? 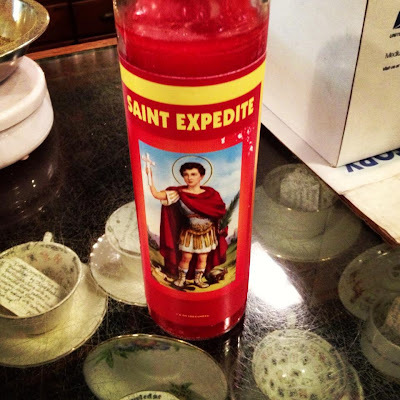 There have been times St. Expedite has not come through for me personally. It sure was discouraging, however, looking back I was coming from a place of fear and did not see the options I had readily available. It was important to learn this so I wasn't using the Saint as a crutch. One must learn to live their own life. 5) How do you "repay" St. Expedite when he comes through for you and/or your Clients? and how important is it that you do that in a timely manner? The first payment I will always do is tell others about St. Expedite and publicly thank him for his help. This has been done through the newspaper as well as posting it through Social Networks and forums. He sure does like the attention! 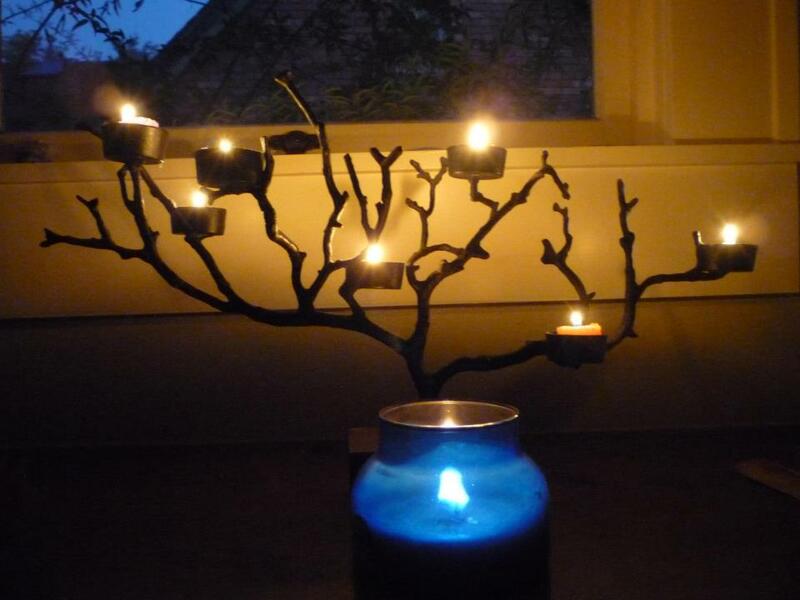 After doing that I will give him a fixed red glass encased candle. Holes are pocked into the wax then a little St. Expedite Oil dripped into the holes, and prayed over. A couple slices of pound cake. I like to give him three. 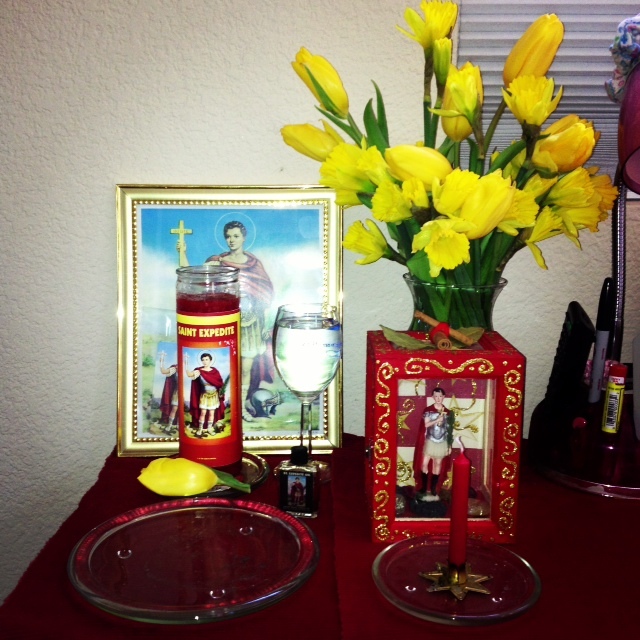 Then lastly flowers for his altar. In more recent years, I have had the blessed opportunity to travel down to New Orleans for the past three years for the Folk Magic Festival. With each visit a “pilgrimage” is made to the Our Lady of Guadalupe Church to thank him for the blessings he has provided. 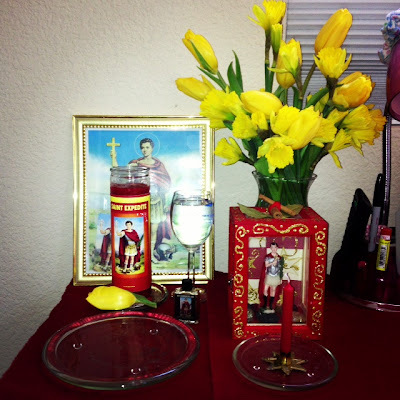 How important is it to “repay” St. Expedite in a timely manner? VERY important. This cannot be stressed enough. As he has swiftly came to your aid, so to shall you be swift in payment promised. 6) What advice would you give someone who is contemplating working with St. Expedite? This was mentioned above and is always worth repeating. Be prompt in your payment to St. Expedite. I have seen to many not keep their word, and the miracle be taken away just as quickly as it arrived. Your word is your bond, and only promise that which you can keep. Be respectful and polite while petitioning. I have met a few folks who would yell at and demand St. Expedite to work for them. Yet they wonder why their petition would never be answered. Petition St. Expedite when you really NEED a rapid solution to a difficult problem when no other options are available. Ask for one favor at a time. 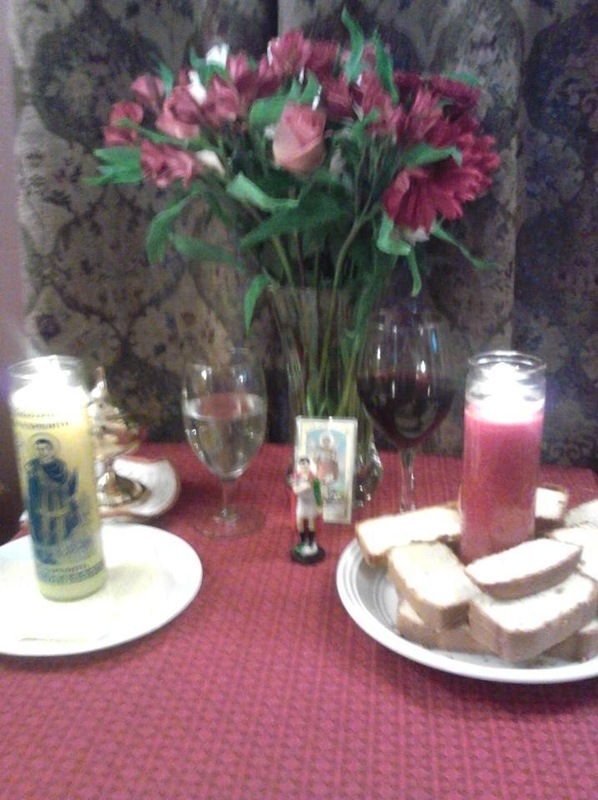 Take some time and get to learn more about St. Expedite. Lucky Mojo has a great page on him. 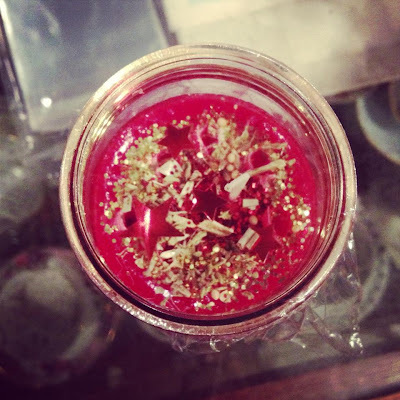 Dr. E has written a wonderful blog post, and Momma Starr has some great info on her page as well as in her Candle Burning book. 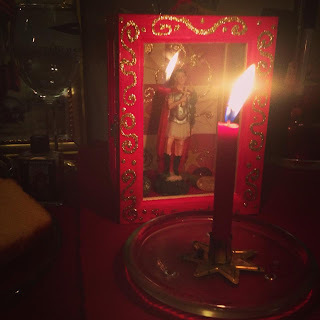 Thank You Papa Newt for your time and knowledge on St. Expedite and your generosity in participating in this blog post contest! 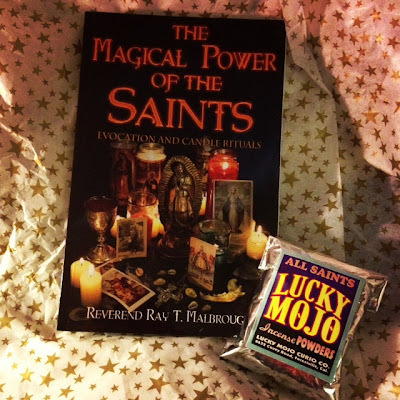 OK... in keeping with the "Saint-ly" theme, this month I chose both "The Magical Power of The Saints" by Reverend Ray T. Malbrough paired with Lucky Mojo All Saints Incense Powder! I knew this was going to be a Give Away item right away when I posted a photo of the book I had just purchased on one of my many pilgrimages to the Lucky Mojo Curio Co. There was quite a bit of "fan fare" surrounding this book and I asked the question if people would like to see it as a Give Away on the blog, which was met with a unanimous YES! ﻿A package of Lucky Mojo "All Saints" incense powder is also included as not all Saints have their own line of "goods" or some may be hard to come by. This way, you can cover them all, or just the one(s) you are petitioning. Quoting Sister Robin of Lucky Mojo Curio Co. she depicts it as "Being the 409 of Saints"
Normally I would run my contests for 2 weeks, but as I have said before I am in the process of moving and I also wanted the winners to have time to prepare their petitions/rituals in time for St. Expedite's Feast Day. ﻿You all know the "rules" but in case you don't, all you need to do is share this blog post on your Facebook and tell me that you did by writing "shared" on my status update I will provide; ultimately leads one to win this very fabulous package of All Saints Incense and The Magical Power of The Saints" book from Lucky Mojo Curio Co OR a custom St. Expedite spiritual working from Papa Newt! Best of Luck to everyone who enters to win these very special prizes! 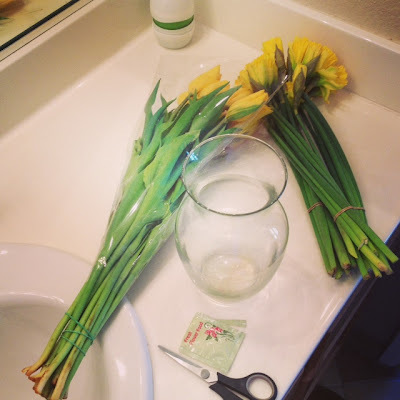 It's that time again and spring has sprung here on my blog! I would like to introduce this months Reader/Rootworker of the Month for April; is none other than Miss Bri Saussy! I have been holding on to this little "gem" of a worker because to me, she embodies what Spring Time/April/Easter is to me. A gentle, warm, positive, and uplifting spirit that whom people "flock" to after the storms life throws at you. I myself was one of those people. Years ago, when faced with a person whom I held so dear to me gave me news of their moving across the US to opposite end, I fell apart. I was a wreck; ridiculous actually. I came to find Miss Bri. After having a divination with her, not only did I find a Non Judgemental ﻿reader but also someone who I could easily confide in. She predicted that while Yes this person was going to move onto a new phase in his life, but when the time came I would not be shedding any tears. OK... that was very hard to believe seeing as I was at a total break down at the time I called her. She did not try to sell me any unneeded services, only encouraged me to take some time for myself and to heal the wounds I was harboring with things I could do on my own. If I did want her services, she would be glad to help but did let me know that she would not be doing anything that she felt was not for MY highest good. That is Ethics right there folks! That is a sign of a great worker. Well guess what?.... She was right! When the time came for my friend to leave, we said our "good byes" and I watched him go. Not one tear was shed. I have not had any Rootwork Services done by Miss Bri, BUT she has an incredible Testimony Page on her website that speaks for itself. 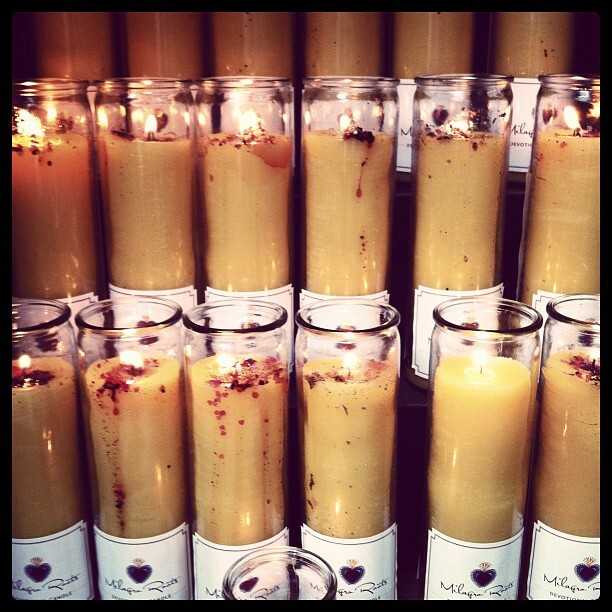 Though one of these days I AM going to have one of her custom Beeswax Vigils set by her... 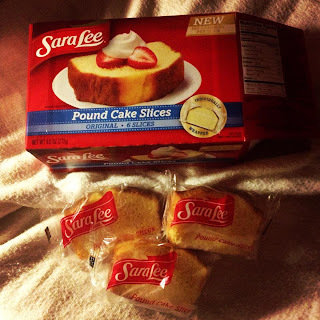 I have been eyeing them since the day she advertised them. Ladies and Gentleman, I present to you Miss Bri of Milagro Roots! I perform intuitive readings utilizing various divination tools and techniques including: tarot, oracle, and Lenormand cards, crystal scrying, astrological analysis, pendulum work, bone throwing, palmistry, & tasseomancy. I also am often sought to interpret dreams-even though I don’t really advertise this service. My clients really like me-and I LOVE them-they trust me to use whichever technique or combination of techniques works best for them at the given time. My mother, Momma Hen-also at AIRR, was my very first divination teacher. 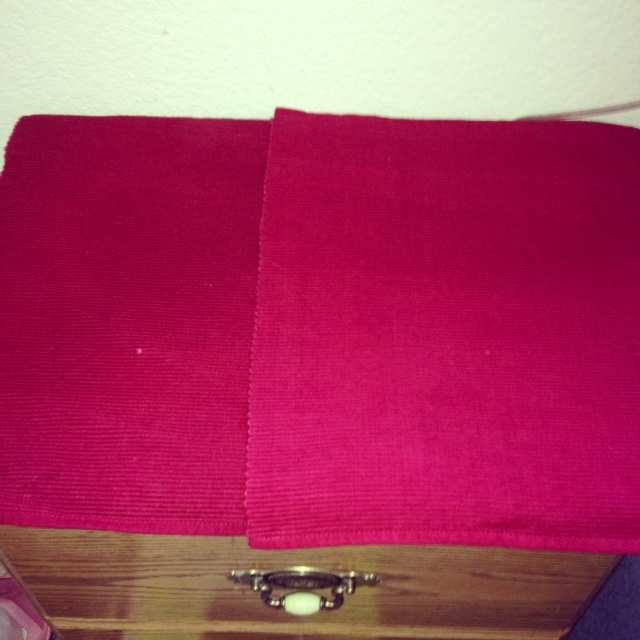 She taught me how to read tarot, playing, and oracle cards and how to consult an astrology chart. I learned bone throwing from my great-aunt and my grandmother, I have also studied with Flora from AIRR, catherine yronwode has been a dear mentor and friend, Theresa Reed is a wonderful colleague that I exchange ideas with regularly and Heidi Rose Robbins continues to blow my mind with her astrology know how! When its appropriate to the case I do prescribe spiritual supplies-both my house brand as well as Lucky Mojo Curio Company supplies. I do not prescribe ritual work or supplies at every reading because sometimes a situation does not call for that approach. I do! I offer a monthly phone-fest that is group magical coaching. I spend an hour going over a specific aspect of ritual work-every person who registers for the call received a PDF workbook and a recording of the conversation-that way if they did not make it live they can still listen. 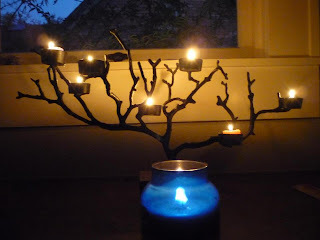 I also have a year and a day magical training program called the Miracle Tree Sessions wherein I teach a very ecclectic approach to magical and ritual work. The Miracle Tree Sessions is limited to 13 students every year. Other than that, if a client wishes to get one on one magical coaching they can contact me for a regular reading and we will spend the time crafting the right ritual approach for them! 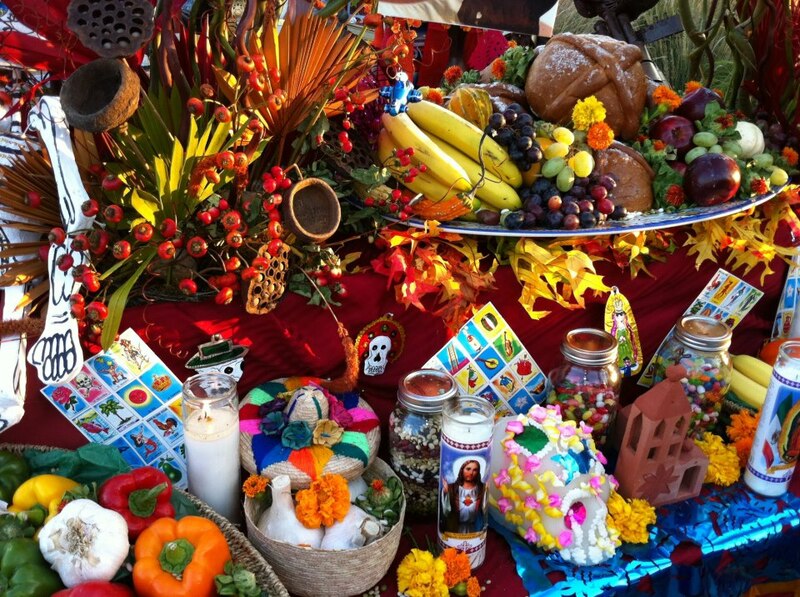 I grew up in the South (in Texas) and my maternal line comes from East Texas, Louisiana, and Mississippi-so this work and this particular magical tradition is really in my blood. I also grew up Baptist and attended (and sang in) small country churches--so again there is a strong vein of this type of magic running through me. I learned a variety of tricks and tips from my mother, her father, and her mother-the people that I grew up around in church, the families that we associated with-Conjure is one area where I learned the practice way before I learned the theory. The theory was first really codified and taught to me by catherine yronwode. Before her, I had heard of Hoodoo but no one I knew would ever call what they were doing “hoodoo”, I had heard of Conjure more frequently, but there was no formal title-it was just the stuff you did, the little tricks, and rarely, working the roots. My grandparents, people I attended church with when I was young, my mother, Momma Hen, catherine yronwode and the crew at Lucky Mojo. The graduates from HRRC that I keep in touch with, my colleagues at AIRR, my clients-I have some wonderful older clients who have been around this work for most of their lives and I have hip younger clients who are in urban areas who are always picking up new stuff-they all teach me and I am grateful to them. Also the women of Pretty Girl Hair Salon in San Francisco-they taught me a lot in a couple of years. I have been practicing I guess since I was about 3 and a half and I petitioned God successfully for a little sister-God got it right down to the hair color (I was pretty specific). I have been professionally practicing since I was 14 years old. 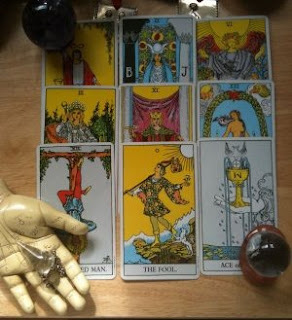 I have been a full time professional intuitive reader and ritualist for the past 4 years. Love and reconciliation cases, cleansing, blessing, prosperity & job advancement and job getting cases, court cases and legal jobs, break up work-I have a good success rate across the board. I don’t take on revenge work and I do not take on gambling work or jobs. Absolutely-I am blessed to have clients that are comfortable providing their full names and pictures-you can view them all at my testimonials page right here. For sure-there are some awesome pictures on my AIRR page. You can also find shots throughout my site and also on followgram. Love, Reconciliation, Magnetic Attraction, Creativity, Money-Abundance-Affluence, and Court Case work. 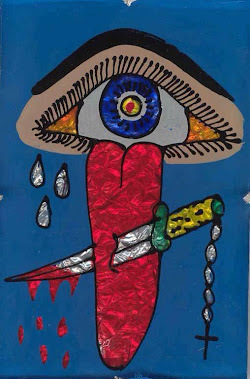 I do not do straight up gambling jobs, lucky numbers are tough for me but I do have a good method for deriving them for folks, I am ok at healing but I am not amazing at it-I have too many really incredible healers in my life to kid myself on that. I am a happily married woman therefore I will not break up marriages. 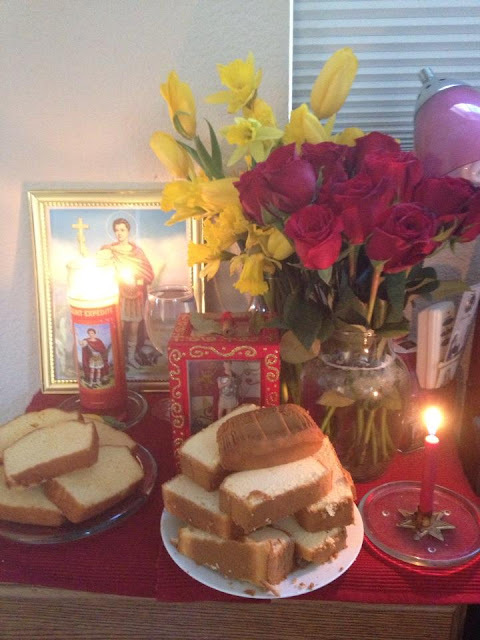 I have strong personal objections to animal sacrifice so I do not participate in any religion or spiritual path where that is part of the liturgical practice, I do not perform revenge work on behalf of others, and generally due to my own philosophy and moral outlook I encourage people to work for and towards the good. I will not participate in work that seeks to separate a mother from her children, or that takes a harsh edge towards elders or young children. I grew up Baptist and left the church when I was about 13 years old because my best friend at the time was a young man who was gay and I invited him to to church only to hear the preacher delivering a blistering sermon about homosexuals going to hell. Needless to say, I was done. However-despite its shortcomings being Baptist left a deep imprint on me and there are many things about my church going days that I love and miss-especially the gospel music. My grandfather played guitar and I sang with my mother, sister, and grandmother, and those are awesome memories that I cherish. My father’s side of the family is Catholic and I learned a lot about Catholicism in my youth as well. I have studied various Pagan paths, Judaism, Buddhism, Hinduism and Christianity all in depth. I hold a masters degree in Eastern classics and got to study Ancient Greek and Sanskrit and translate parts of the New Testament from the Greek and the Bhagavad-Gita from the sanskrit. All this is to say that I appreciate religion and religious devotion generally speaking. In my own life I consider myself as coming out of the Perennialist school of thought-which sees value in many different religious traditions but also advises the adherence to one specific path. The path I follow is not religious as much as it is classically philosophical both in the world of the Ancient Greeks and Hindus-it is a three fold path of Devotion to what is beautiful and good, Knowledge and the pursuit of wisdom, and action accompanied by discernment and skill. I am devoted to Mary, to Our Lady of Guadalupe, to Archangel Michael, and to St. Expedite, but I also talk with the faeries. I am most interested in what is good and true in life and how each one us can shine brighter right here and now. I think it really depends on each individual case, client, and situation. I regard broad brush rules of thumb with suspicion generally speaking. I think that if a full forty days has passed and you have not seen any signs or movement then you are probably going to need to either drop it or take a different approach. I also sometimes find a full moon cycle to be indicative of success. Again-it depends on the person and the situation. Most frequently when there is work to do at home it involves spiritual bathing, the recitation of certain prayers/Psalms/affirmations, sometimes reading a specific book (yes, I do assign homework!) and spiritual cleansing of the home/work space. If work is not successful its important to understand WHY its not successful and to get closure on that cycle or to try a different approach depending on where you are with the situation. I think that the crucial element is trust. If you trust your spiritual advisor then you can believe what they see and say without reservation but if you don’t then its going to be a confusing process. How do you know who you can trust? You look at testimonials, you read blogs, you see what the person’s style is like-but most importantly you know what the qualities are that make someone essentially trustworthy for YOU. On the other end, as a magical worker you get very clear on what kinds of clients you love to work with and how best you can serve them. Trust is key. I do. My monthly phone-fests provide very inexpensive group coaching and I provide in depth coaching through the Miracle Tree Sessions. Give it away for free and don’t be cheap. I think the biggest mistake I see new workers making is that they price themselves way under what the “big names” are charging in an effort to scoop clients. I did this unknowingly when I started out full time-I was not trying to scoop clients from other workers-I just felt that I needed to have lower rates because I had not been a “professional” for a long time like others had. The problem with having low rates is two-fold-if you are any good at your work you are soon going to have more demand than you can serve and then you start seeing people not respond to emails, miss or show up late for a consult, delay ritual work forever, and generally have poor client communication. The worker feels spread too thin and not justly rewarded for their work, the clients feel confused and annoyed, and the entire outfit feels disorganized. Then you have to spend precious time repairing relationships and then you have to go through the process of gradually raising your prices so that your work is actually fiscally sustainable. A better approach is to give high value content away for free. Start an interview series with people in the field you love, think about what your clients want/need to see more of and provide that for free in blog posts, videos, phone conferences-whatever. Give good stuff away for free and charge fairly for your paid products and services so that your work is actually the sustainable joy its supposed to be instead of a drag that you thought was going to be a good time. The other big mistake is not really knowing who you want to serve. This is a business about relationships. I ADORE my people-they and my beautiful family are what enlighten and enliven my life-they inspire me to continually show up and do my best work. If you are a worker and you don’t really like people or you have been working for awhile and you are not over the moon about your people then you might need to look at that closely. Not every worker agrees with this philosophy but it has stood me and my business in good stead. 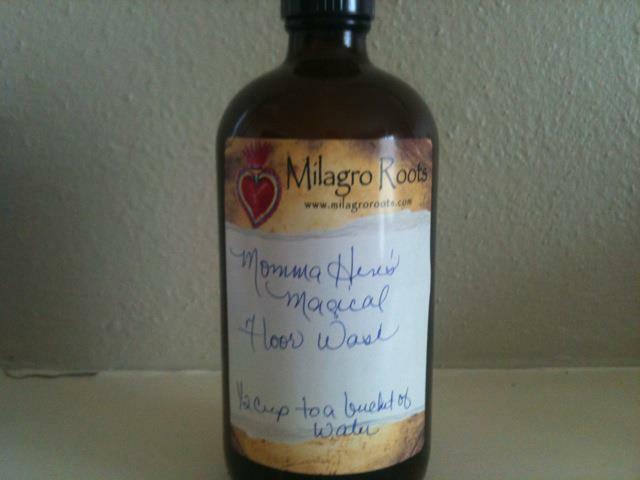 Thank You Miss Bri of Milagro Roots! Here is an opportunity to learn from one of the best in Conjure!